Ginkgos have been around for a long time. They are technically a conifer and one of the only surviving species of gymnosperms that grew back in the age of the dinosaurs – over 65 million years ago. The variety ‘Fastigiata’ seen here, is a narrow growing, male variety that will get 30-50′ tall and 12-15′ wide. The distinct fan-shaped leaf adds interesting texture to the landscape. Ginkgo turns a beautiful golden-yellow color and soon after, drop their leaves – but this variety holds their leaves once they turn for up to 2 weeks, then you can enjoy the carpet of gold after leaf drop. 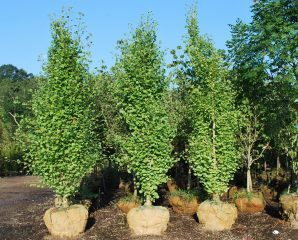 Plant Ginkgo in full sun in well-drained soil. They are tolerant of a wide range of soil conditions and urban sites. They’re also deer resistant and hardy to zone 3! Other varieties we currently have in stock include ‘Autumn Gold’, ‘Jade Butterflies’, ‘Magyar’, ‘Princeton Sentry’, ‘Troll’, and ‘Spring Grove’. Call either office to confirm availability.